I'm just lovin' different pattern papers lately! Okay, so sometimes I hoard them, and don't want to cut into the beautiful patterns, can you blame me? Here I used up some scraps of Websters Pages, pulling in the Orange from the flowers by adding the Scallop Die, Scallop Border and Base Card color in Tangerine. The sentiment is from Heartfelt Creations stamped in Black Archival on Vanilla card stock, layered on a Black panel, then scalloped Tangerine Panel. 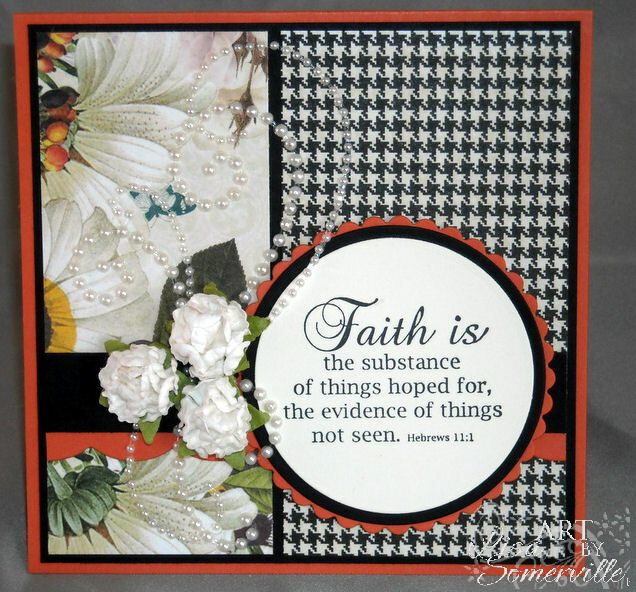 The Scallop across the card comes from the Decorative Butterfly-Border Die. I love this die because it has two beautiful edges to choose from. I added some Zva Flourishes and Prima Flowers to complete my card. I love this paper, the flower. VERY CLASSY and ELEGANT! This card is sooooooooo gorgeous!!!!! So beautiful, Lisa. Love it! Love your card! that patterned paper is so pretty. Very dramatic, yet beautiful card. Lovely! You sure know how to put it all together and make it look perfect GF! How beautiful! Gorgeous use of the papers! So elegant! Lovely design. That paper with the sentiment is beautiful. Great color choices! OH WOW this is just gorgeous,Lisa! love those paper and can see why you had a hard time cutting into them! Gorgeous details love the pearl flourish! Thank so much for playing bingo with us at Simon Says Stamp Challenge! Just beautiful, Lisa! I love that sentiment and your added little, floral details! Thanks so much for playing along with us in the Wee Memories Scrappy Saturday Challenge!